Heavy gauge construction adds more pounds and strength to the Schmeiser Tri-Plane Leveler than competitive designs for longer life, dependability and performance. Combine the flexability of a hydraulically controlled folding blade with Schmeiser dependability and the Folding Tri-Plane is the perfect solution for all your needs. The Schmeiser PFS Series Precision Finish Scraper offers growers the advantages of laser and GPS applications with the versatility of conventional land leveling. The high speed and maneuverable Varitrak 3 Pt. Leveler acts like a long pull-style land plane. The hitch in the front has a special self-leveling linkage that compensates for uneven ground. Ideal for open field work, the Schmeiser SGB Series Grader Blade offers high-quality grading where laser and precision scrapers are not necessary. 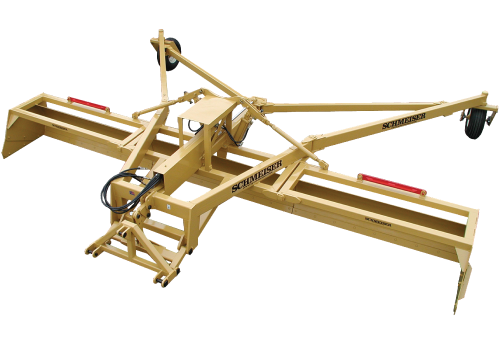 Built to last, the Schmeiser Quad-Plane Leveler incorporates the best characteristics of traditional land plane with legendary Schmeiser durability.